hello, I've just got an issue with my PARANORMAL DNA250C device. 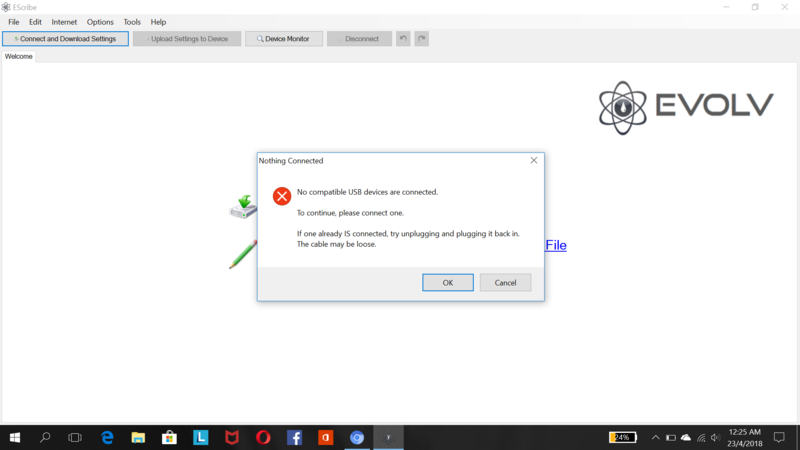 when i plugged on my laptop, its charging but somehow i can't connect it to eScribe. I already tried on 2 laptops with 3 diffrences of USB and its just the same problem. i'm stressed out regarding to this issue. Hi guys, i have the same problem ! I also download Escribe from EVOLV official page right now, but it doesn't works! Plugged directly into PC USB2 port? Tried different cables, ports, rebooting? Had the same problem with device not connecting. Right click on escribe icon and 'run as administrator' solved the issue for me. Some USB cables are "charge only" in which case you'll get that message and be unable to connect to escribe even though the mod is drawing power. Won't happen if you use the cable that came with your device (one for my phone works too).